Starting in 2014, health insurance coverage for individuals and small businesses will become available through new state health insurance exchanges. Most importantly, the key tax credits (e.g. the small business healthcare tax credits) and tax subsidies (e.g. individual health insurance tax subsidies) will only be available for coverage purchased via a state health insurance exchange. 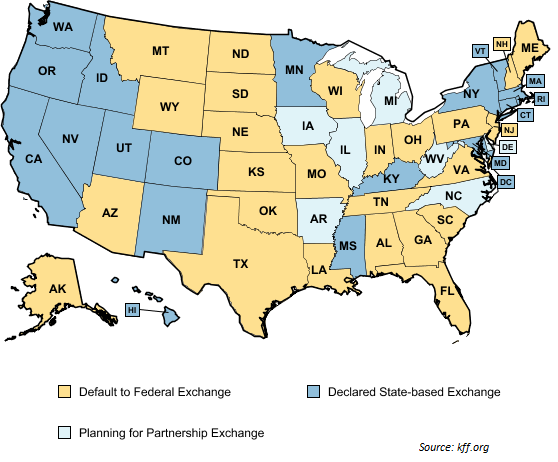 Below is a summary of progress for health insurance exchange implementation on a state-by-state basis as of December 14, 2012. They can default to a Federally-Facilitated Exchange.